Important Note #1: This camera can shoot in both the Sony XAVC or AVCHD formats. This workflow follows recording in the XAVC format and we strongly advise students to record in the XAVC format rather than AVCHD. XAVC is both higher quality, and also less problematic when editing with Adobe Premiere. To set this in the camera, please refer to page 46 of the hardware manual for the FS5 and choose one of the XAVC options rather than AVCHD. Important Note #2: This camera can capture in both standard high definition as well as Ultra HD (4K). We recommend that students record in standard high definition formats for ease of workflow. To set this in the camera, please refer to page 46 of the hardware manual for the FS5 and choose one of the menu items that says “XAVC HD” rather than XAVC QFHD. Important Note #3: If you do record in Ultra HD (4K), the Sony FS5 will allow you to record low resolution proxy files in additional to your Ultra HD files. We strongly recommend that students turn this function off and instead use Adobe Premiere’s built in ingest proxy generation feature instead. To set this correctly in the camera, please refer to page 47 of the hardware manual for the FS5 and set PROXY REC MODE to “OFF”. For more information on the Premiere Proxy workflow please refer to this comprehensive youtube video tutorial, or make an appointment with our IT/Post-production staff for an in-person tutorial. AVCHD Note: If you accidentally recorded in the AVCHD format (rather than XAVC) your files will be located in the AVCHD package within the Private folder. If you are unsure which format you recorded in, you can double click on the AVCHD package and see if clips are visible in Quicktime Player which will automatically open. 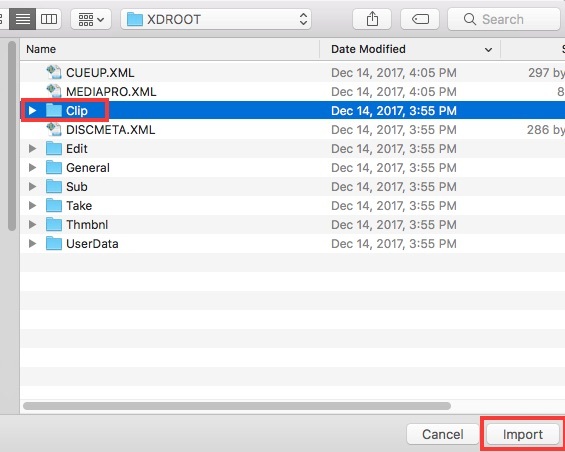 If no clips appear, then you correctly recorded in the XAVC format and can simply copy the XDROOT folder instead. Be sure to import your media in step 3 before formatting your cards to be sure you copied the correct folder. 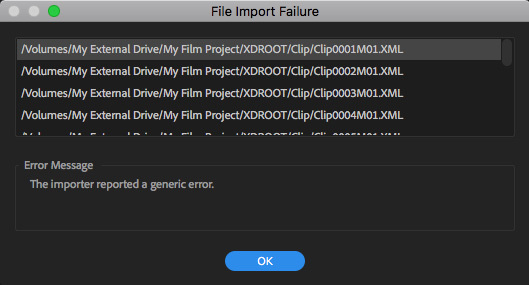 If you are unsure, the best way to make sure you have your material successfully copied is to test importing them into a Premiere project after copying them to your hard drive. 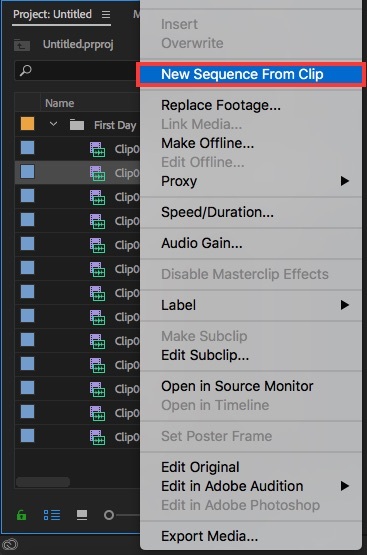 Step 6) You will now see a folder named Clip in your project panel. 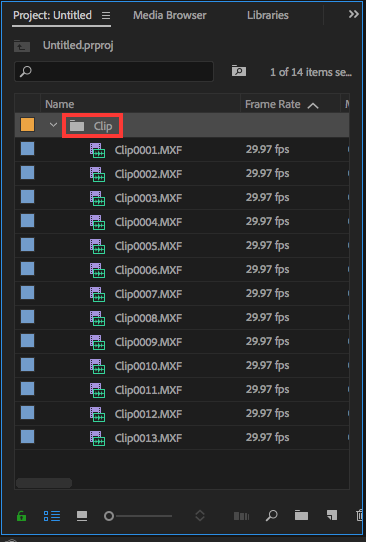 It is best practice to rename this to describe the group of footage, otherwise you will have many folders named Clip on multi-shoot projects. The easiest way to rename this folder is to right-click on it, and choose Rename from the menu. Tip: Try downloading and using our Default Premiere Folder Structure Template when starting a new Premiere Project. This can be used to serve as a template for you to insert and organize your media on your hard drive prior to starting a new project which can greatly help.